What Happens When a Brand Embraces Its Story? I love finding brands who have deep-seated community values, who embrace the story of what made them become a brand in the first place, and who have a vision for how they plan to grow into something awesome. Sure, we live in a world where many brands and people are focused on getting ahead and achieving only monetary goals. But there are plenty of brands and marketing teams that enjoy being part of the community and are incorporating a big-picture mentality with story-worthy assets into their business models. And guess what? Consumers, especially millennials, love this. When I find such a brand, my soul gets a little happier, and of course I have to share it with the world. Jones Scones is my new favorite example of such brand. They’re a brand to watch from the digital marketing world because they are already doing creative things that outshine giant brands. Here are some highlights from the Jones Scones approach to business to get the wheels turning and creative juices flowing when it comes to integrating community and the bigger picture into your influencer marketing plan and overall branding. This new wave of savvy consumers has made businesses realize that, more than ever, brands need a story as much as they need an awesome product. When a curious visitor investigates your brand’s site and social channels, they want faces and real stories to connect with, not a robotic site with vague and generalized communication. I love that when you visit Jones Scones online, not only is “our story” a section on the site, but their story is spread throughout the site. When the owners talk about their brand, they don’t stick to baking fun facts and the fundamental and technical baking tactics they use. They talk about their Shark Tank experience and how they want to contribute to the overall planet with their brand’s success. Not only should your brand lead with its story foot forward, but you should convey how your brand is part of an overall community. How does your brand fit into the overall organism that is our planet? How do you give back and perpetuate things that are happy? Jones Scones has an initiative called #spreadthelove where they encourage all consumers and social followers to simply do something nice for someone else. How cool is that? As humans, we all make mistakes. Not one of us is perfect, and we all have a few things we wish we’d done differently. A brand should be no different. Not only is it okay to talk about times your brand made a mistake, but it’s desired. True transparency and authenticity is what creates the type of connection that makes brands soar. While Jones Scones has had success by getting their scones in Whole Foods, they’ve also experienced a setbacks. They made a mistake with a packing company and went into a period of “rebuilding.” This story, as told on their website, is one of the things that spoke to me most about the brand. They admit mistakes and show their consumers how they are growing. When it comes to making sure your brand is authentic, just give them the real you. Be upfront with your brand’s mistakes and your wins. Put headshots on company bios on your homepage. Share photos of your office going to happy hour or celebrating someone’s birthday. Ask for their opinions in quarterly surveys. Reveal new products that are coming out before you tell the rest of the world. Openly discuss your brand’s values and stand behind them with a passion, so your consumers can embrace your story, too. My favorite part of the Jones Scones website is where they talk about how much people love their scones and share that they are baffled Starbucks has yet to carry them. They even go as far as to promise 50,000 to anyone who can get their scones into Starbucks’ door. Your site should amplify the voice of your consumers and influencers. Instead of having only the voice of your brand on your site, include testimonials and earned media. I also love when brands incorporate consumer voices beyond their website, in marketing emails, blog posts, social shares, and other places where consumers want to hear about you, not from you. 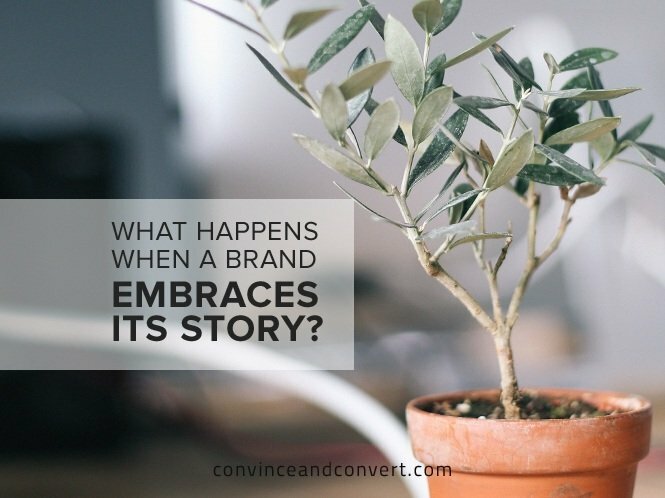 Does your brand have an awesome story that you want me to help you tell? Email me at kristen@grouphigh.com—I love telling stories about brands who make my heart sing!